As Founder of 1000Bulbs.com, Kim Pedersen oversees an award-winning business that continues to grow and exceed customer expectations.In 1979, Kim responded to an ad for a lighting sales position, where he sold lighting door-to-door throughout the Midwest. 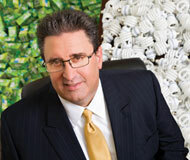 Soon after, he relocated to Dallas, TX to work for a national lighting distributor. With his career developing, Kim decided that the time had come to start his own business. Using a small amount of personal savings, Kim began his operation from his home, creating an office out of a spare room, an old typewriter, and a desk fashioned out of an old door and two saw horses. Determined by the drive to succeed, he sold products by day and invoiced paperwork by night, often working without a break. Business thrived, and Kim was ready for something more; he began researching the Internet as a portal to the marketplace. It soon became evident the market was ready for this new buying experience, and 1000Bulbs.com was launched in 1996. The company grew rapidly, creating jobs and developing a growing amount of engaged customers, earning Kim the 2010 Ernst & Young Entrepreneur of the Year award. Today, Kim continues to strive for excellence, always moving forward with cutting-edge ideas and promoting customer satisfaction.